NEW YORK (CNNMoney) -- News Corp.'s iPad-exclusive newspaper, The Daily, will launch next week at an event in New York City. The company sent an invitation to reporters Thursday morning. The launch will take place midmorning on Feb. 2 at New York's iconic Guggenheim museum. News Corp. CEO Rupert Murdoch will be at the event, along with Apple (AAPL, Fortune 500) Internet services executive Eddy Cue. The Daily will be the guinea pig for Apple's new subscription option for purchasing iPad content. Until now, Apple has only let publishers sell individual issues, paralleling the company's model for selling apps. The Daily plans to sell its subscriptions for 99 cents per week, News Corp. executive James Murdoch said at a media conference this week, according to Reuters. News Corp. (NWS, Fortune 500) has been at the forefront of charging consumers for online journalism, including running a paywall around some content on the Wall Street Journal's site. The Daily has been in the works for several months, but its launch date was delayed. AllThingsD said earlier this month that there were some technical issues with Apple's new subscription service, which will debut alongside with The Daily. The subscription service will be "a new 'push' subscription feature from Apple, where iTunes automatically bills customers on a weekly or monthly basis, and a new edition shows up on customers' iPads every morning," AllThingsD reported. Beyond the technical challenges, many questions are swirling around The Daily. Pundits and bloggers alike have wondered if the world is ready for an iPad-exclusive newspaper -- and if it even wants one. 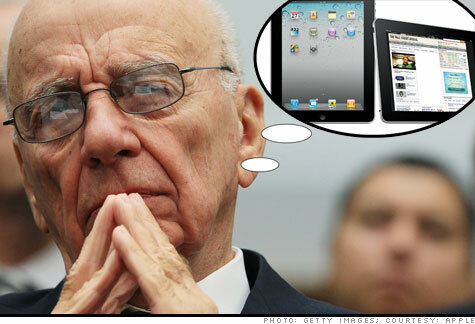 Others wonder if iPad buyers are the type to buy subscriptions to newspapers. Still, that demographic is growing larger: Apple reported sales of 7.3 million iPads in the holiday season, for a total of 14.8 million iPads sold for the year.